Sometime when you are on the tour and your phone battery is going to die in that situation there is no way to get the call on your phone. But in that case you can easily divert mobile phone calls to any number using the secrete codes. Many time when you are doing some important things and you will be disturb due to receive any call or downloading will be stop. Your smartphone has lot of different secret codes which are very useful for us. When you are doing any important work or need to run internet only at your smartphone but due to any call stop them. In that situation most of the person want to know how to stop all phone calls but internet is running properly then you can take help of secret codes. In this guide we’ll discuss any the secret code which allows you to divert the phone call to any other number. Due to call divert your phone internet is running properly but all call divert to any other number. This secret trick quickly divert mobile phone calls to any number. This trick is related to USSD (Unstructured Supplementary Service Data). To use this trick you must have to use special wildcard astrick (*) and hash (#). You must have to dial a number with the combination of hash and astrick which easily divert mobile phone calls to any number. You can choose other number either out of network area or number is switched off. You can use given shorcut secret code to quickly divert mobile phone call to any number easily. To Activate call divert on your phone then dial **21**Number# then press Call Button. If you want to cancel the call divert on your phone dial ##21# then press Call Button. To Check the status of call divert dial *#21# then press Call Button. To Cancel all diverted calls then dial ##002# and press Call button. 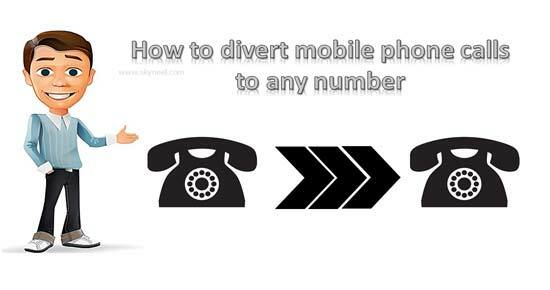 I hope you like this How to divert mobile phone calls to any number guide from which you will be able to easily divert mobile phone calls to any number without any extra efforts. If feel any problem in this guide then please use comment box. Thanks to all.